Got a rip? Got a tear? Don’t throw it away! Chinook Klear K-Tape to the rescue! 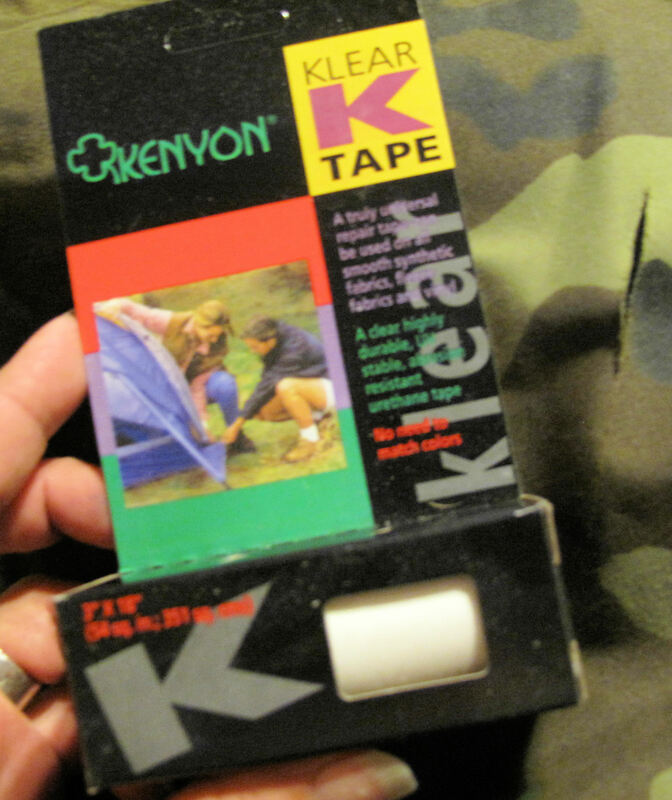 Seriously, this stuff has got to be a serious answer to saving money on all sorts of camping, clothing and other synthetic equipment that can be ripped up and torn. 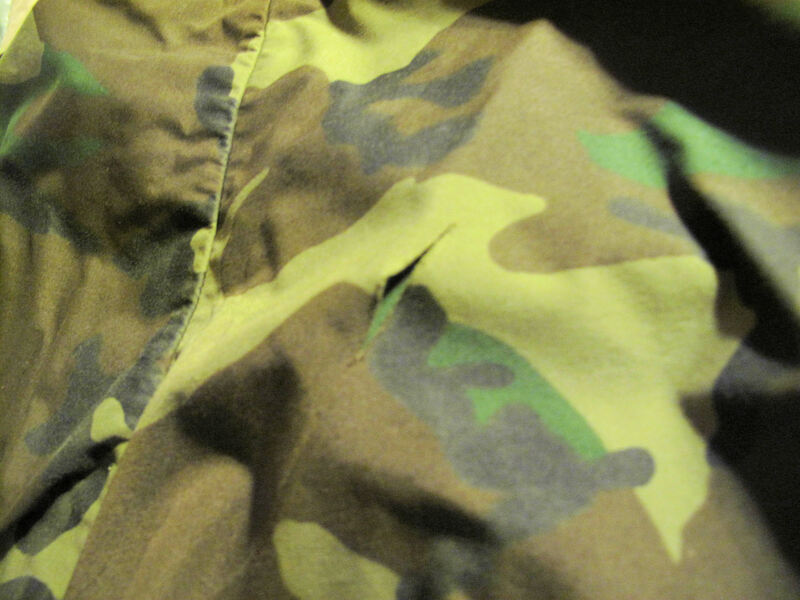 Back story…dear heart over at Vacreepinoutdoors and I were getting ready to go into the woods one rainy day, he took out his water resistant camo pants (I still have yet to figure out why when you go into the woods outside of Turkey hunting season why it seems everything is CAMO, but that is another story) and lo and behold a NICE rip was on the right, er, posterior hip area (the technical term for buttocks). Typical DH fashion, it was a shrug and out the door we went. He’d just wear them and not worry about it. But me, the typical woman is thinking…okay buddy, just sit on something wet or in the snow and your rear end is wet and cold, both of which can be deadly (think hypothermia). I must admit it was rather attention getting following through the woods as I do (no feminist issues here!) but that is besides the point. Since he is not the type to replace things unless it is 75% off or comes from a thrift shop, I was left wondering how the heck to fix it. These water resistant pants are lined with some sort of mesh so turning them inside out and sewing them wasn’t going to work, not to mention the fabric is a rather thick cotton/nylon who knows what material. Sewing from the outside would allow moisture in still, not to mention be UGLY. The only thing left in my mind was a patch, but how to match the fabric? I know they make iron on patches and after a bit of discussion about this with DH he left it up to me, after all, it was less than 2 inches long and the right color patch wouldn’t really matter. So off to my one of my favorite places to shop…Amazon…just google iron on patch and boom! 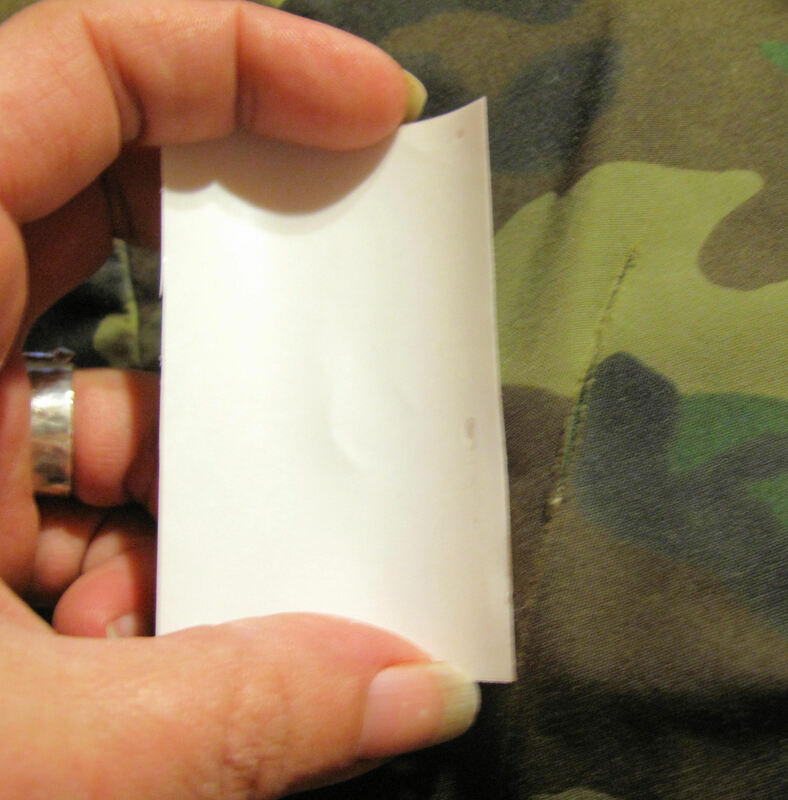 Well, this Chinook Klear K-Tape came up along with iron on patches (which were rather expensive and from past experience not exactly easy to use and not that hardy sometimes). And only $8 (free shipping with Prime)…the back of the package gives a ton of suggested uses from nylon type pants, tents, grill covers, down coats, bags…just about ANYTHING you can imagine. Hands down, my new best friend! Forget the ‘sewing’, the ‘sewing glue’, hot iron patches….I mean how many times over the years have I (and you for that matter?) struggled to repair something nylon or nylon like only to have a mess on your hands, it looking ugly or just having it rip even more or throwing it away, thus having to replace it? So I bought it, after all, $8 bucks nowadays is a meal at McDonalds which I can skip and the pants are rather pricey to replace. IMPORTANT NOTE: what you are repairing has to be DRY!!! First you will want to cut off a piece that is at least ¼ inch longer on both ends of rip/tear. 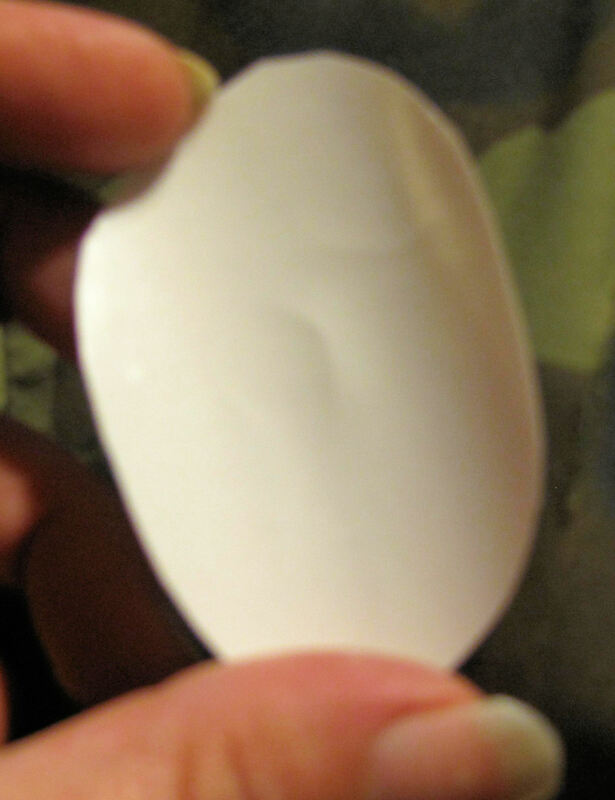 Next, to avoid corners that will peal you will want to trim this section of tape into an oval or at the very least round the corners (especially if it is a long rip/tear). 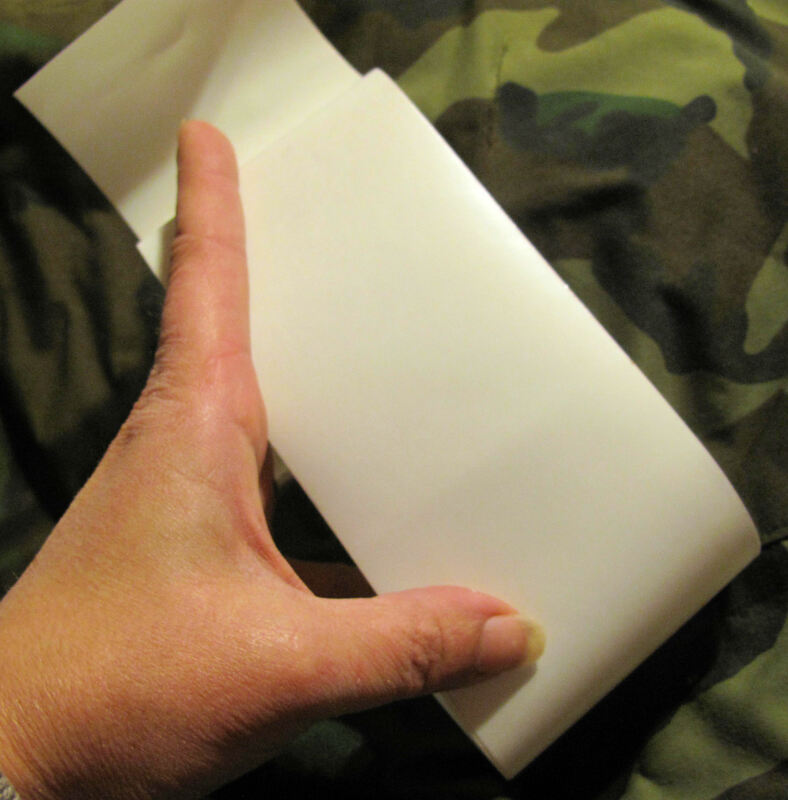 Lay what you want on a hard flat surface, peel the tape away from its backing, bring the two pieces together and FIRMLY put that tape over the rip/tear and smooth down hard to make the bond. Personally I found a glass bottle with a rounded edge and went over it with that to make it smooth and to give a harder ‘pressing’ than my fingers could. Bingo…repaired…it is a bit shiny and noticeable? as it is not REALLY clear tape but you know something? It WORKED. And I am thinking that after use/washing it will be even less noticable. 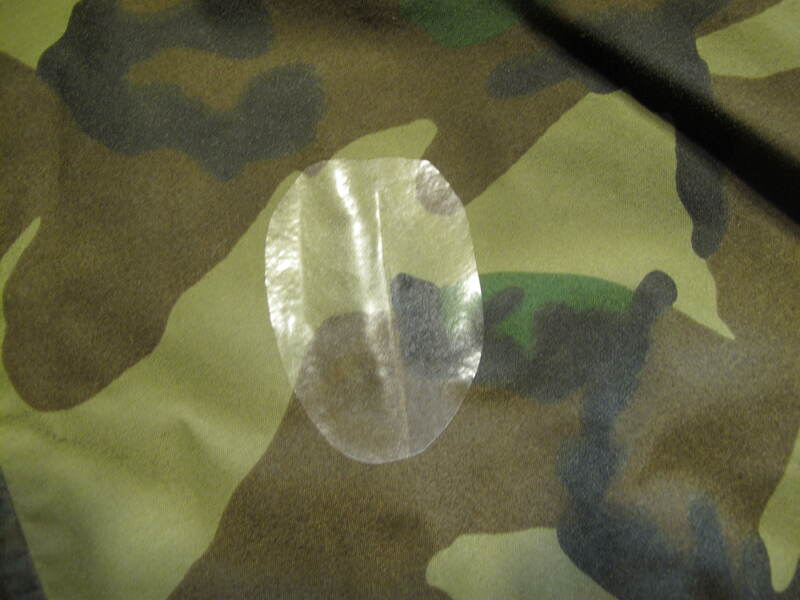 I have scratched at the tape, pulled, tugged and its staying PUT…knowing what I know about glues I am not washing it yet, but Vacreepinoutdoors will be wearing them out this weekend when we go ‘test’ our cold weather survival gear. Its supposed to rain and be cold so we shall see if it stands up to hunting, camping, sitting, and all that, but my guess is it will. My only wish is that I could have gotten to the backside to reinforce the rip with another piece of K-Tape. People use this to repair tents and if that was my purpose I would do both inside and outside of the tent. Hmmm, I can see lots of applications outside of the woods…kids jackets, rain jackets…they say it works on fleece too (but use it on the inside for appearances sake). So don’t throw that tent, frog togs, jacket, cover or whatever away! Repair it! Save yourself a lot of money and get the K-Tape…try it…it will make you a believer. And btw, this would be great to have in your bug out bag or camping/hunting pack…just in case! As a side note, Vacreepinoutdoors and I, Survivingshtfmom, are teaming up to bring you live and in person lessons and hands on training to prepare, survive and thrive through Eastern Woodlands Prepared Survival School in central Virginia. 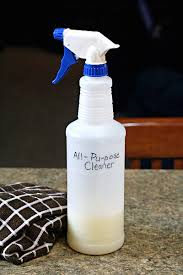 This castile soap spray is great because you can easily clean multiple surfaces with it from fabric to fixtures! Also, because it’s so easily biodegradable, it’s great for not only cleaning indoors, but outdoors, too! 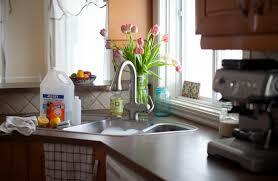 You can easily rinse away the soap without worrying about harming plants or waterways. It’s also very safe and gentle on the skin, so no worries about harmful chemicals. This recipe makes 8 ounces, so multiply the ingredient amounts as needed to fit the size of your spray bottle. If you don’t wish to customize the spray with your own essential oils, simply omit the essential oils. 2. 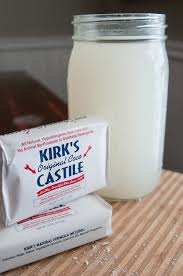 Using a measuring cup and funnel, pour the water into a spray bottle and then add the castile soap. 3. Add the essential oils directly to your spray bottle. Note: A range is given because the size of drops depends on the essential oil dispenser cap. 4. Shake the bottle to incorporate the essential oils and soap. 5. Label with a permanent marker. 6. Store the bottle out of direct sunlight or heat, which can change the chemical constituents in the essential oils. 7. To use, spray any areas that need to be cleaned and wipe with a damp cloth. For tougher cleaning jobs, like grout, use a toothbrush or scrub brush. IMPORTANT!!! Remember to come back after you spray and use a DAMP Rag to wipe with otherwise you wind up with soap build up . 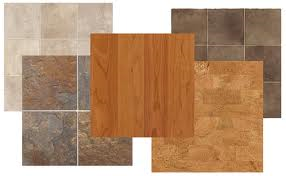 I do NOT recommend using the below on real wood or bamboo flooring as many of the ingredients are drying to wood fibers. If you choose to use this on real wood flooring remember to come back with a damp mop and then dry.